2.4 GHz control system ensures the stronger anti-interference performance and powerful signal. Equipped with HD 0.3 MP HD camera, convenient for to capture and record every unforgettable moment. 360 degrees 3D eversion, professional cool and excellent flight action. 6 axis gyro providing the awesome stability during indoor and outdoor flight. 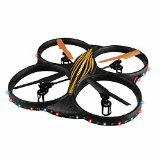 Designed with colorful LED light, suitable for flying in the dark at night. 1Pcs 3.7 V 500mAh Lithium battery, easy to charge and repalcement, meeting your long flight experience needs without the worry of battery power shortage. 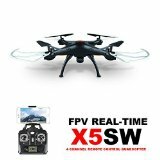 Latest Syma X5SW Explorers 2 quadcopter, advanced ready to fly RTF FPV model. The FPV aircraft can fly indoor or outdoor, it can photo and video FPV,360 degree 3D rolling all-around, headless function. Specially, It can Real-time transmission. The X5SW has been upgraded, the shell is shiny and high quality, the reinforced landing gear, the 2.0 MP Camera and so on. Genuine, Original Brand New, Factory Price. Usually we send your order within 1-2 days.Ship from China By Epack Registered Airmail (not by normal airmail), Tracking number is available, More Safer.7-12 Working Days Delivery. Good Service and no fee 1 Year Warranty (excluding man-made damage) is our company policy, which doesn’t includes after-sale shipping cost.14 Days Refundable after you received if you are not satisfied with the item; We sell, We care!Buy With Confidence!